Alexandria’s Hibernians have noticed that something is missing from Alexandria’s newly renovated Fitzgerald Square: the name of Col. John Fitzgerald. Ironically on St. Patrick’s day of this year, the City Council of Alexandria announced without explanation that the new upscale park would now be designated “King Street Park at the Waterfront,” stripping the name of this prominent Irish American from the public space. 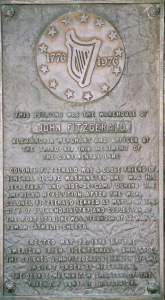 The plaque on Colonel John Fitzgerald’s warehouse, one of Alexandria’s oldest building, highlighting his contribution to his adopted land and city. The warehouse adjoins the park that was once named “Fitzgerald Square” in his honor until recent inexplicable actions by the City Council. It is unfortunate that at this moment in our country’s current debates on immigration that the city of Alexandria has chosen to expunge such a prominent example of the contributions of immigrants to this country as well as specifically depreciating the contributions of Irish Americans to our communities and nation. The members of the Herbert-Cady Division of the AOH have started a Change.Org Petition calling for the restoration of the Fitzgerald Square name to the park which presently has over 1,000 signatures. That petition may be found here for those wishing to add their signature. 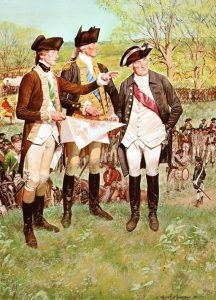 At the recent AOH National Convention, the Hibernians adopted a resolution ” condemn(ing) in the strongest terms this outrage against our Irish history and heritage and insult of all Irish-Americans” and called “upon the Planning Commission, City Council, and Mayor of Alexandria, Virginia to rescind its renaming of the waterfront and return the good name of Colonel John Fitzgerald—immigrant, patriot, and war hero—to the public square named in his honor”.